Not many compilation series’ are still going strong after twenty-eight years.Those that do, must be doing something right. That is certainly the case with Ace Records’ Girls With Guitars’ series, which began in 1989. That was when the first instalment in the Girls With Guitars’ series was released by Ace Records’ Impact Records imprint. 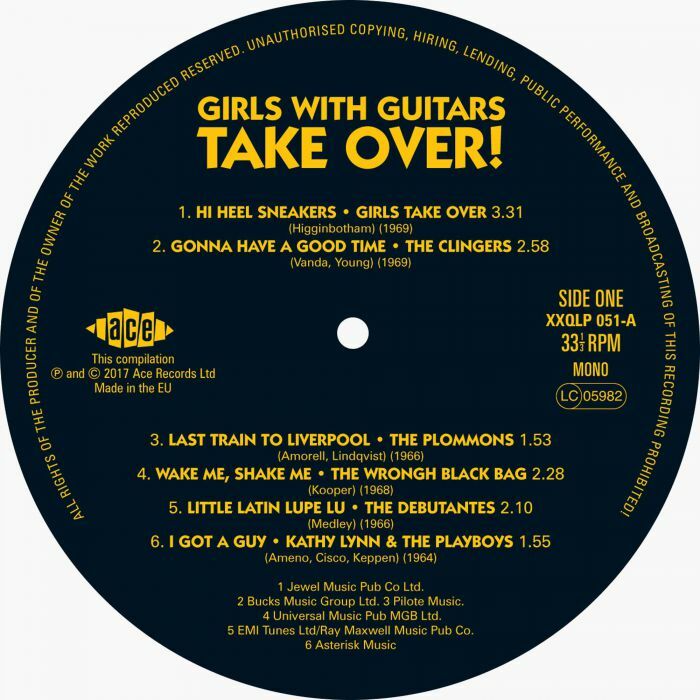 The first instalment in the Girls With Guitars’ series was released on vinyl, which was still to be overtaken in the popularity stakes by the compact disc. This would’ve changed by the time the Girls With Guitars’ series returned. Fifteen years passed before Girls With Guitars’ series was released on Ace Records in April 2004. Ace Records was now the permanent home to the Girls With Guitars’ series, and this was a new start for what would become a popular and long-running series. By the time Girls With Guitars was released in April 2004, the music industry was a very different place. Everything from how music was made, distributed and consumed had changed since 1989. So had the way people listened to music. While the first instalment in the Girls With Guitars’ series was released on vinyl, the second volume was released on compact disc was. That was how most people listened to music by 2004. Vinyl had fallen from favour in the early nineties, with many record collectors selling off their collections and trading up to compact disc in the pursuit of perfect sound quality. Back then, it looked as if vinyl was gone for good. Another five years passed before the next instalment in the Girls With Guitars series was released in April 2009. This was Destroy That Boy! More Girls With Guitars, which was released on compact disc. Just like previous volumes, Destroy That Boy! More Girls With Guitar received praise and plaudits upon its release. It seemed that with every new instalment in Ace Records’ Girls With Guitars series it found a wider audience. Despite the increasing popularity of the Girls With Guitars’ series, there was no sign of it becoming an annual event. Instead, it continued to be one of Ace Records’ many occasional compilation series. Eventually, a new instalment in the Girls With Guitars series arrived five years later. However, by then, much had changed. The Rebel Kind-Girls With Guitars 3 was released on compact disc in March 2014. It was the third instalment in the series since it found a home on Ace Records in 2004. This latest volume was released to critical acclaim, and found favour with music fans. By then, there had been a resurgence of interest in all things vinyl. This was good news for record companies and remaining record shops, who had experienced some tough times over the past twenty years. They welcomed the resurgence of interest in vinyl, which began not long after Ace Records had released Destroy That Boy! More Girls With Guitars in April of 2009. Suddenly, a new generation of younger music fans had discovered vinyl. Older music fans clambered into their attics for their long forgotten vinyl collections. Other music fans regretted selling their vinyl collections in the late-eighties and early nineties and began rebuilding their record collection. Vinyl was back. As a result, the sales of turntables were soaring and many record companies started to release albums on vinyl. This was just as well, as the resurgence of interest in vinyl meant that record buyers were eschewing the compact disc. Instead, they were willing to play extra for the high quality 180 grams heavyweight vinyl. This included many fans of the Girls With Guitars’ series. In October 2014, Ace Records released Girls With Guitars on red 180 grams heavyweight vinyl. This was fitting, as twenty-five years had passed since the first instalment of the Girls With Guitars was released on vinyl. The newest addition to the Girls With Guitars’ series found favour with record buyers old and new. So will the latest addition in this long-running series. 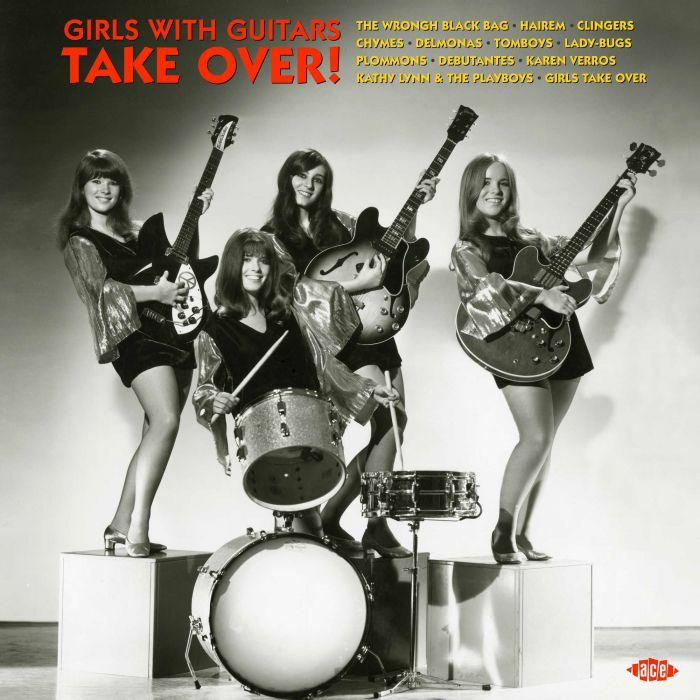 Recently, Ace Records released Girls With Guitars Take Over! 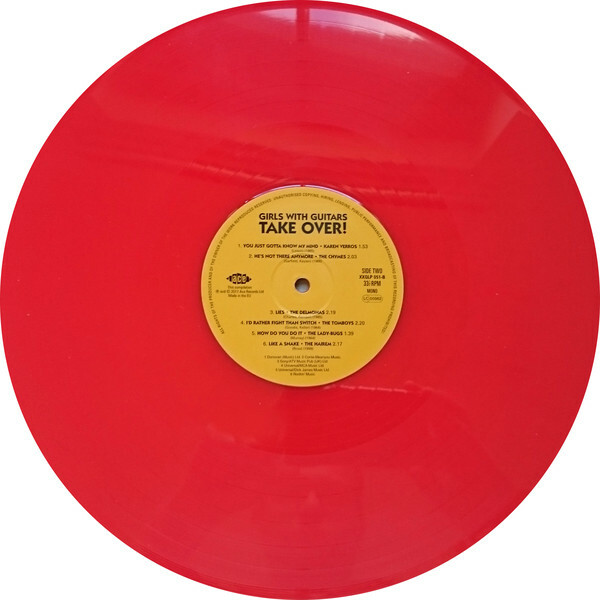 on red 180 grams heavyweight vinyl. 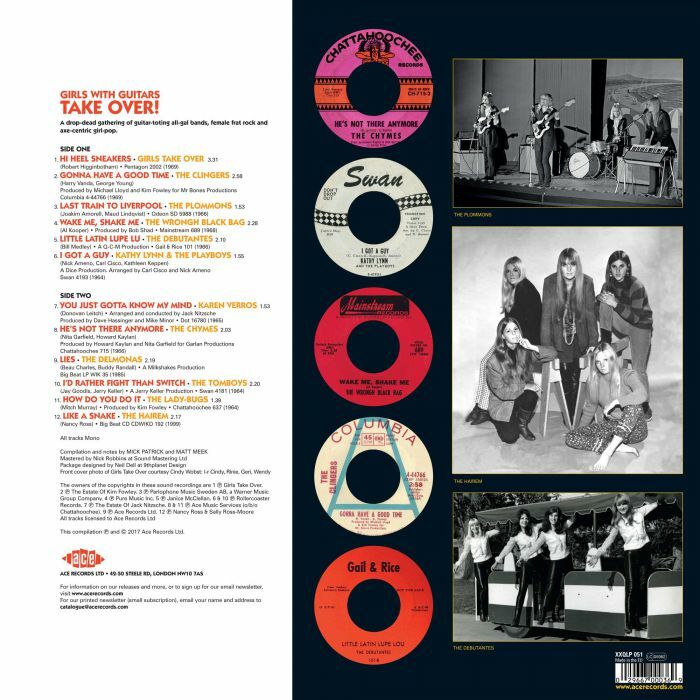 It features twelve tracks from Girls Take Over, The Clingers, The Wrongh Black Bag, The Debutantes, Karen Verros, The Delmonas, The Tomboys and The Lady-Bugs. They’re among the twelve guitar-totting girl groups that strut their stuff on Girls With Guitars Take Over! By 1969, the Milwaukee-based Girls Take Over had been together three years, and were a familiar face on the local live scene. They had come a long way since they were formed in 1966. So much so, that Girls Take Over had recorded their debut single Stardust Come Back. 200 copies were pressed and the single was released later in 1969 on the Pentagon label. Tucked away on the B-Side was a cover of the Robert Higginbotham composition Hi-Heel Sneakers. It found Girls Take Over giving Tommy Tucker’s hit a garage rock makeover. With its raw, lo-fi sound, Hi-Heel Sneakers epitomised the garage rock sound and sets the bar hight for the rest of Girls With Guitars Take Over! The Clingers featured four sisters, Debbie, Melody, Patsy and Peggy, who were born into a musical family in Salt Lake City. In 1964, The Clingers embarked upon a recording career. 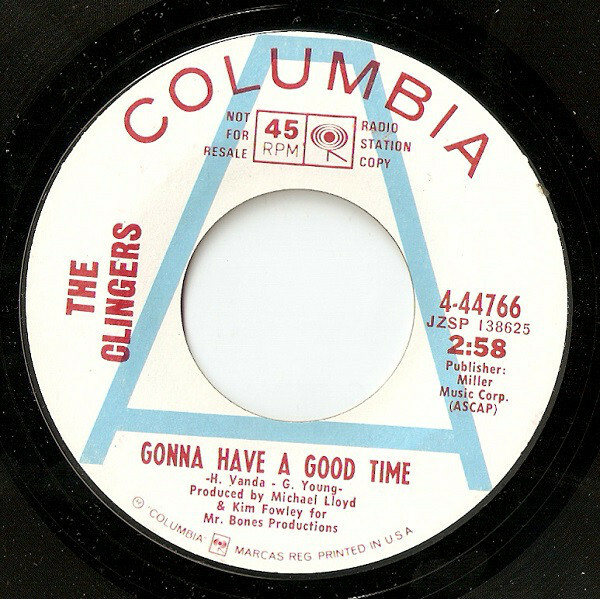 Five years later, and The Clingers had signed to Columbia, and were about to release their cover of Harry Vanda and George Young’s Gonna Have A Good Time in January 1969. It was produced by Michael Lloyd and Kim Fowley who were responsible for a melodic, memorable, rocky and sassy fusion of pop rock and psychedelia. Forty-eight years later, and it’s stood the test of time and is a welcome addition to Girls With Guitars Take Over! 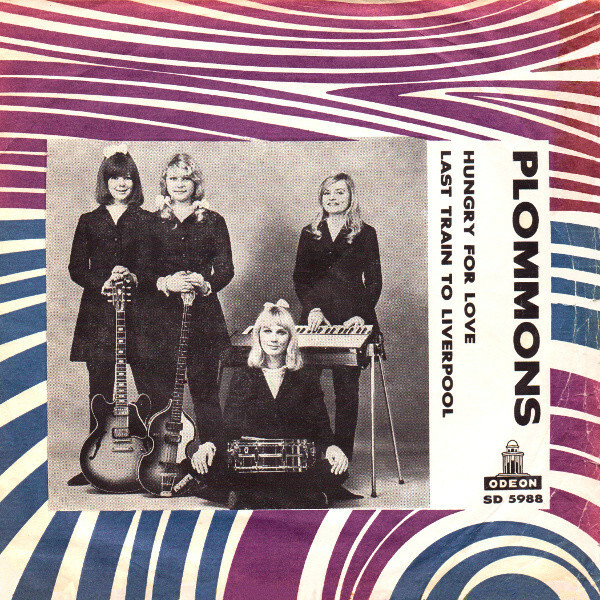 Plommons were Swedish girl group whose recording career began in 1966 and was over by 1967. During this period, they released a trio of singles, including Hungry For Your Love which was released on the Odeon label in January 1966. Hidden away on the B-Side was Last Train To Liverpool which was penned by Joakim Amorell and Maud Lindqvist. The members of Plommons bring to life this pop rock homage to the city of Liverpool. 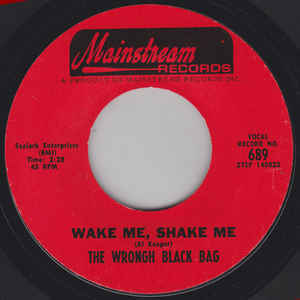 When The Wrongh Black Bag came to record their debut single, they decided to cover Al Kooper’s Wake Me, Shake Me. It was produced by Bob Shad and released on his Mainstream Records in August 1968. Wake Me, Shake Me is best described as garage rock meets psychedelic rock, and features some blistering guitar licks. Despite the quality of the single, it failed to find an audience and The Wrongh Black Bag’s recording career was over before it had even begun. The Debutantes were formed in Detroit, in 1964 by fourteen year old singer Jan McClellan. Over the next few years, the band’s lineup continued to evolved, and in 1966 The Debutantes made their recording debut. They released several singles, including On Broadway. On the B-Side was a cover of Bill Medley’s Little Latin Lupe Lu, which The Righteous Brothers released as a single in November 1962. Since then, several bands had covered the song. Little Latin Lupe Lu featured on the B-Side to The Debutantes single On Broadway, which was released on the Gail and Rice label in 1966. Ironically, Little Latin Lupe Lu which was a really catchy pop song, was the stronger of the two tracks and may have fared better than On Broadway. Despite that, The Debutantes’ popularity grew, and they worked with some of the biggest names in music. However, by 1969 years of constant touring caught up with The Debutantes, and the band called time on their career. When Kathy Lynn and The Playboys were looking for a song to record for their sophomore single, they eventually settled on Carl Cisco, Kathleen Keppen and Nick Ameno’s My Special Boy. It was released on Swan in August 1964 and is a mixture of pop, garage rock and surf rock. It’s a potent, melodic and memorable combination, and is the perfect way to close side one of Girls With Guitars Take Over! In October 1965, Karen Verros released her sophomore single You Just Gotta Know My Mind on Dot Records. It was a cover a Donovan composition that was arranged by Jack Nitzsche and produced by Dave Hassinger and Mike Minor. They played their part in Karen Verros’ future freakbeat cult classic Just Gotta Know My Mind. The Chymes released their debut single Bring It Back Home on OKeh Records in March 1966. Five months later, in August 1966 they released Quite A Reputation on the Chattahoochee label. Hidden away on the B-Side was He’s Not There Anymore which was penned and produced by Howard Kaylan and Nita Garfield. It’s a hook-laden hidden gem from The Chymes, who are responsible for an enchanting example of jangling garage rock. Eleven of the twelve band on the compilation were around in the sixties. The exception is The Delmonas, whose recording career began in 1984 and lasted until 1989. In 1985, The Delmonas released their debut album Dangerous Charms on Big Beat Records. One of the songs on the album was the Beau Charles and Buddy Randall composition Lies. It was given a Beatles’ influenced makeover, as tight harmonies accompany a defiant vocal on one of the highlights of Dangerous Charms. For their debut single, The Tomboys covered Jay Goodis and Jerry Keller’s I’d Rather Fight Than Switch. It was released on Swan in May 1964. 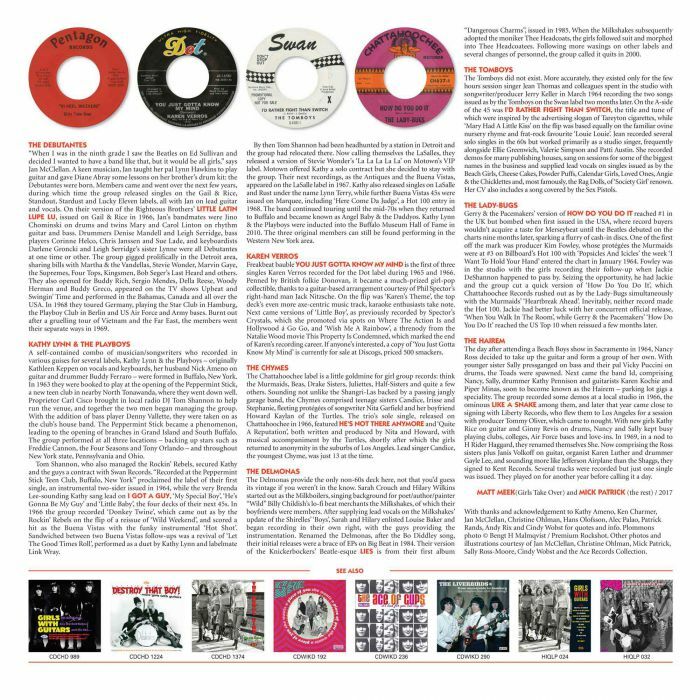 By then, there were a number of successful girl groups, and record labels were looking for the ‘next big thing’. Alas, commercial success eluded The Tomboys, and they never released a followup to I’d Rather Fight Than Switch. Fifty-three years later, and I’d Rather Fight Than Switch returns for a well deserved and belated encore on Girls With Guitars Take Over! Just like The Tomboys, The Lady-Bugs only released the one single. This was the Mitch Murray composition How Do You Do It, which was released on the Chattahoochee label in February 1964. 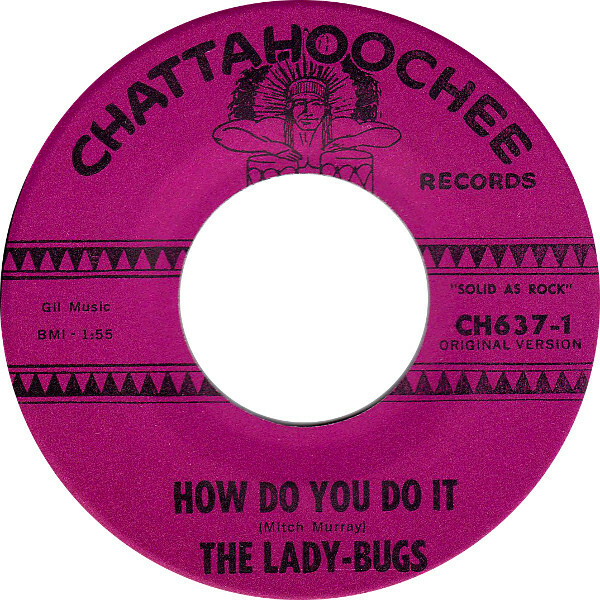 By then, the Chattahoochee label had enjoyed some success with girl groups and The Lady-Bugs were hoping that How Do You Do It would bring commercial success and critical acclaim their way. While it’s a melodic fusion of pop and rock, commercial success eluded The Lady-Bugs and the they never released another single. By 1966, Nancy Ross had formed three bands The Toads, Id and The Hairem. She had been inspired to form a band after seeing the Beach Boys live in Sacramento in 1964. That was a turning point for Nancy Ross. Two years later, and The Hairem were preparing to enter the studio and record some demos. This included Like a Snake, a moody, lysergic sounding track. 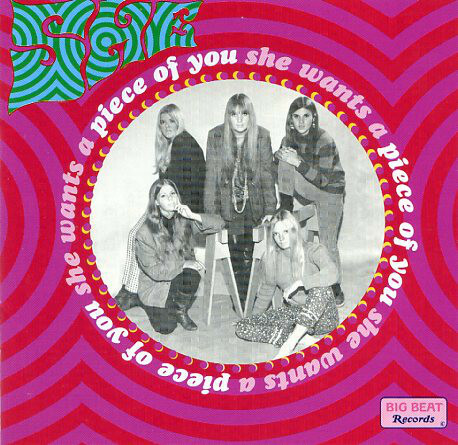 It lay unreleased until 1999, when Big Beat Records released a compilation of music by Nancy Ross’s next band, She. The compilation was She Wants A Piece Of You, which was part of the Nuggets From The Golden State series which featured songs by She and The Hairem. Among them were The Snake, which brings Girls With Guitars Take Over! to a close. 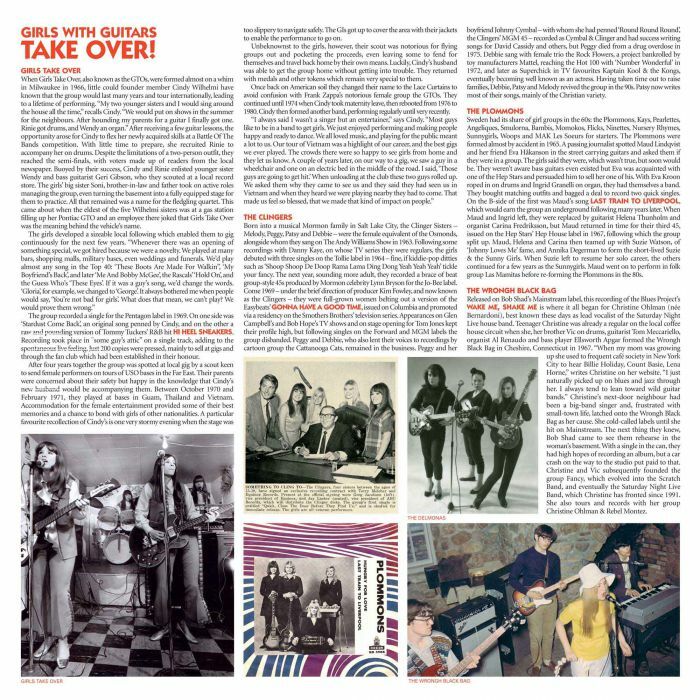 Nearly three years after the previous instalment in the Girls With Guitars series, this long-running and successful series make a welcome return with Girls With Guitars Take Over! 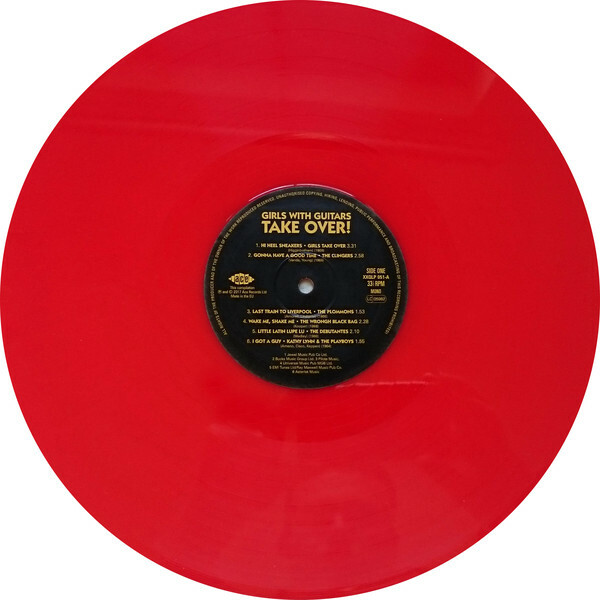 It was recently released by Ace Records on red 180 gram vinyl. Not only does Girls With Guitars Take Over! look great, but sounds great. Girls With Guitars Take Over! is welcome addition to the Girls With Guitar series, which celebrated its twenty-eight anniversary earlier this year. The first instalment in the Girls With Guitar series was released in 1989, Impact Records, which was an imprint of Ace Records. Fifteen years later, the second instalment in the Girls With Guitar series was released on Ace Records. That was a fresh start for the series, and since then, Ace Records has become a permanent home for the Girls With Guitar series. It’s one of many occasional series’ that Ace Records release. Rather than making the Girls With Guitar series an annual occurrence, Ace Records concentrate on quality rather than quantity. As a result, each and every instalment in the series has oozed quality and features a mixture of songs from familiar faces, new names and plenty of hidden gems. This has proven to be a winning formula, and Girls With Guitars Take Over! is no different. Among those who play leading roles in Girls With Guitars Take Over! are Girls Take Over, The Clingers, The Wrongh Black Bag, The Debutantes, The Delmonas, The Tomboys, The Lady-Bugs and The Hairem. 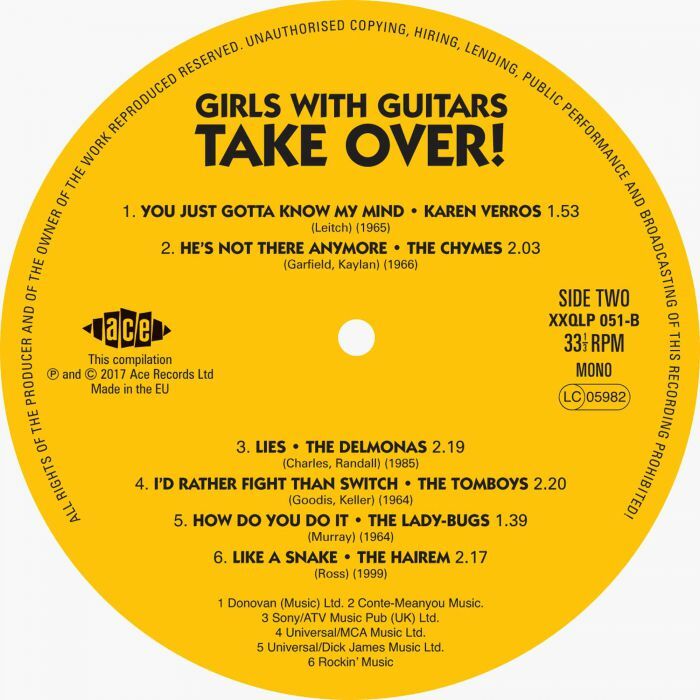 They’re among the twelve guitar totting tracks on Girls With Guitars Take Over! which is a welcome addition to Ace Records’ long-running and successful Girls With Guitars’ series. ← MAINSTREAM MODERN SOUL 2 1969-1976.